DDMA Cachar Recruitment 2018 September | Field Officer Vacancy :- District Disaster Management Authority, Cachar has published a recruitment notification recently. 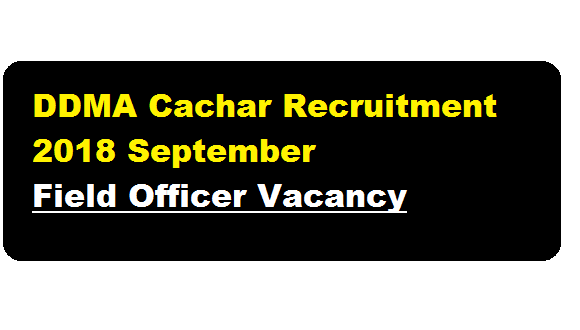 According to the latest District Disaster Management Authority, Cachar Recruitment 2018 September , Intending candidates are invited to appear in Walk-in Interview on 20th September 2018 at 11.00 AM in the Conference Hall of Deputy Commissioner Office, Cachar for recruitment to the post of Field Officer (Disaster Management) on contractual basis to be posted at Revenue Circle of Cachar District under DDMA, Cachar. In this section, we will discuss in details about the recruitment of Field Officer Post under DDMA Cachar Recruitment 2018 September with vacancy details, eligibility criteria, salary with other details and requirement. Essential Qualification : Candidates must have Bachelor’s degree in Science or with Statistics, Geography, Environmental Science or Geology as a subject, from a recognized University / Institution with minimum 55% marks in Graduation. Age Limit : Should not he below 21 Years and above 35 years as on the 1st day of 2018, relaxable in case of SC/ST candidate as per rules. Other Qualification: Computer Skills specially MS word / Excel / Power point / Internet usage / E-mails. Preference will be given to candidates having done RCA or equivalent course on Computer Science. Candidates are requested to bring all original Education / Professional documents, Cast and Age proof certificates. All intending candidates must report for Walk-in Interview within 9.00 A.M to 11.00 A.M on 20th September 2018 in the D.C’s Conference Hall, Silchar and submit Rio-data/resume along with Photostat copies of all educational & professional documents and the Interview will start from 11.30 A.M onwards. No application will be received after 11.00 A.M. on the Interview date.